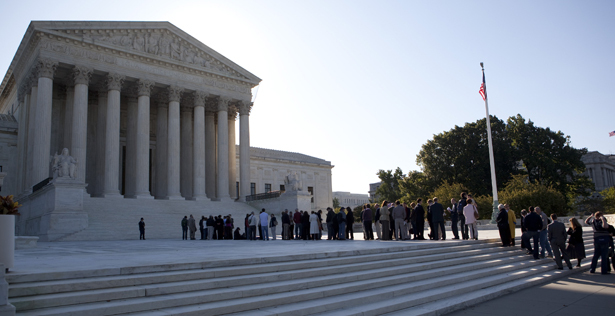 The Supreme Court’s decision sweeps away decades of equal protection precedent. The name of the Supreme Court’s latest case involving university admissions describes the battle lines: Schuette, Attorney General of Michigan v. Coalition to Defend Affirmative Action, Integration and Immigrant Rights and Fight for Equality by Any Means Necessary. When the Court found for Schuette, headlines declared the decision a landmark ruling against affirmative action. But technically, the Court did not retreat from its prior holdings: race sensitivity is still a constitutionally permissible criterion when weighing the applications of similarly qualified candidates. The case addressed a challenge to Article I, Section 26, of the Michigan Constitution, which altered the decision-making capacity of the regents and trustees of the state’s public university system. Section 26 took away those boards’ ability to use otherwise constitutionally permissible race-sensitive criteria for admissions—i.e., a backdoor way of banning affirmative action in the state. Schuette was also a broad capitulation to an old notion of states’ rights, allowing localities to opt out of federal equal-protection measures designed to dismantle segregation. Following this ruling, states can merely override those measures, one by one. The bottom line? What is expressly permissible as a matter of the US Constitution is now forbidden in Michigan. Not only that, it has removed affirmative action in Michigan from the democratic process. Where once these policies were negotiated through elected university boards, requiring a degree of popular will, Section 26 has ended discussion with a blanket ban. The university boards can still consider all sorts of other admissions factors. Your father wants to underwrite a chair in Old Church Slavonic poetry? Welcome to the class of 2018! Your great-grandmother’s cousin was an alumna? Walk on in! You’re an athlete? Here’s your scholarship—just don’t try to unionize, ha ha ha! But consider another scenario. You have one place to fill and two applicants—a white kid from Grosse Pointe, and a black kid who has risen from the ashes of Detroit’s segregated, postindustrial dystopia to achieve the same scores. Put on the blindfold! We don’t see color here. According to Section 26, it’s unlawful to weigh the black kid’s distinct experiences because that would constitute either an act of discrimination against the majority white population or a grant of preferential treatment for minorities. This matter of discriminating against the majority is something that the more conservative members of the Court have dwelled on in the past. Yet as Justice Sotomayor points out in her dissent, majorities—by definition—need no protection, because they can vote down policies contrary to their interests. What they ought not be able to do, she argues, is structure the process so that one group is burdened, as here, with no option but silence. In Schuette, Justice Kennedy, writing for the majority, held that the Supreme Court will not strike down state laws that bar government decision-makers from considering an otherwise legal option. This decision imposes an inane double bind that makes remedying all sorts of equal-protection claims impossible. Sure enough, since the opinion was published, Attorney General Bill Schuette, the named appellant, has been pressing his appeal to reinstate Michigan’s ban on gay marriage with renewed relish. Justice Sotomayor’s dissent presents a detailed history of the fight for full citizenship through equal protection, expositing three generations of legal struggle. First, targeted minorities won the right to vote—a goal that has been codified in law. Second is the ongoing struggle against measures designed to make voting difficult or impossible, through poll taxes, gerrymandering and so forth. The third challenge is the problem in Schuette: whether a majority may “reconfigure the existing political process in a manner that creates a two-tiered system of political change, subjecting laws designed to protect or benefit discrete and insular minorities to a more burdensome political process than all other laws.” Here, it is the restructuring of a government decision-making process that places “substantial and unique burdens” on minorities seeking to be heard. Let us step back and consider Schuette’s significance in conjunction with other strategies that Michigan has taken to remove decision-making from elected officials. Over the last decades, state laws have been passed requiring all cities to slash personal income taxes annually, virtually guaranteeing their bankruptcy. Detroit is only the most visible example. A city’s financial distress, in turn, triggers the ability of Rick Snyder, the Republican governor driving these “reforms,” to appoint “emergency managers” in place of elected officials. The managers knuckle down and sell off public assets to make ends meet. Indeed, Michigan has slashed funds for public universities by double digits. Although race is never mentioned as motivating the cuts, the appointment of emergency managers has targeted African-American areas where long histories of economic precariousness have left the locals vulnerable and, without the ability to fund public services through tax dollars, lacking basic infrastructure. The abrogation of democracy in the Schuette decision goes hand in hand with the reinforcement of racial inequality. While anxiety about access to higher education is, as in Schuette, perpetually styled as a battle royal between black and white, this pitting of one against the other distracts from our failure to invest in all of our public institutions, lowering the quality of life for everyone. Fear of our most needy fellow citizens getting a bigger slice of the “preferential” pie has somehow driven us to bake smaller and smaller pies served at smaller and smaller tables. We seem locked in a fight over scraps, as though unaware of the banquet of generous possibilities we might, by reinvestment, choose to build for our world.